Medical marijuana! How about a prescription for beer? The controversy over medical marijuana is nothing new in attempts to circumvent the law for outlawed drugs. 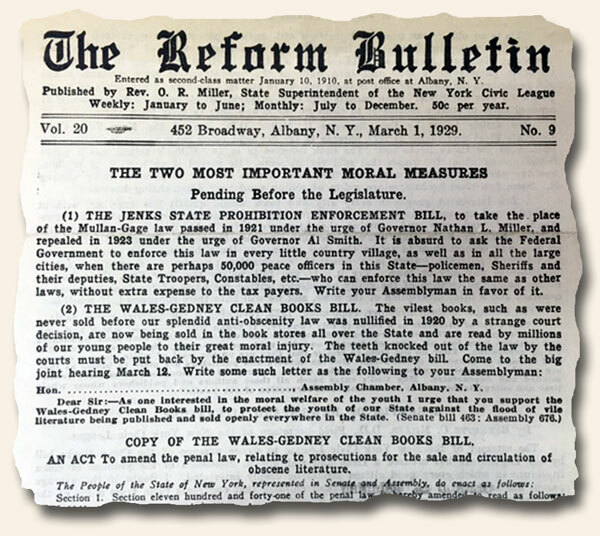 Shortly after Prohibition became the law of the land in 1919, the “New York Times” reported in its Oct. 26, 1921 issue: “Beer As Medicine In Nine States Only” “New Treasury Regulations Inoperative in States Having Local Prohibition” “Thinks People of Nation Will Object When They See Drug Stores Handling Booze”. The article begins: “The brewers have several hurdles yet to make before medical beer is a reality…” with much more. 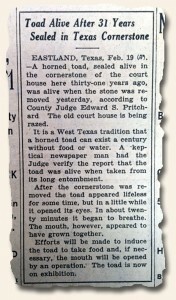 Eastland, Texas surged into the national spotlight in early 1928 when a time capsule, which had been entombed in the cornerstone of the old courthouse, was opened during the courthouse’s demolition. To everyone’s surprise out came a horned-toad lizard – still alive after 31 years! Hoax or not, a tour of the now legendary reptile included a visit to Washington, D.C. to meet President Calvin Coolidge. More can be read about Ol’ Rip via Wikipedia. 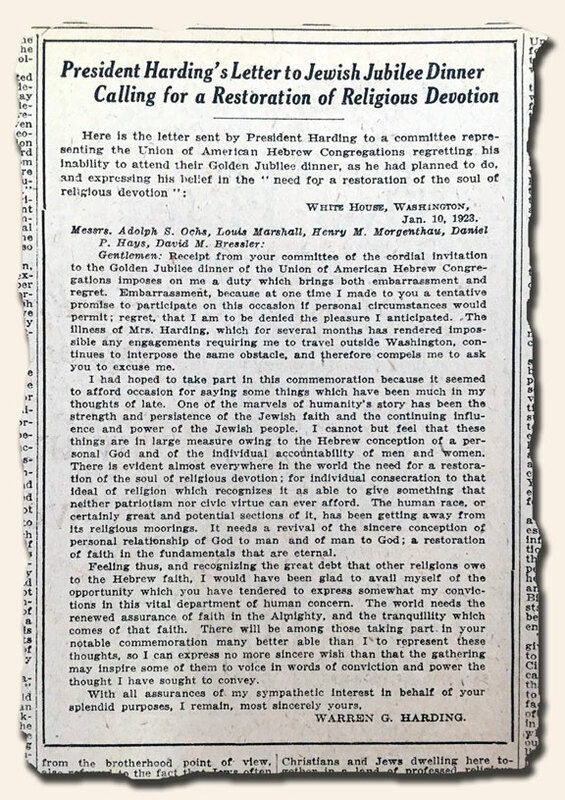 The image shows the report of his “unearthing” which appeared in the New York Times dated February 20, 1928. Sadly, he would not survive another 12 months as he died of pneumonia on January 19, 1929 as reported in the New York Times of the following day. When we think of college fraternity life, scenes of Animal House (whether we’ve seen the movie or not) likely play in our minds as we imagine, among other things, guys relentlessly exploring ways to covertly enter (and eventually exit) woman’s dormitories or sorority houses late at night. The young testosterone-inflamed males are always the pursuers, with the estrogen-nourished females the pursued. 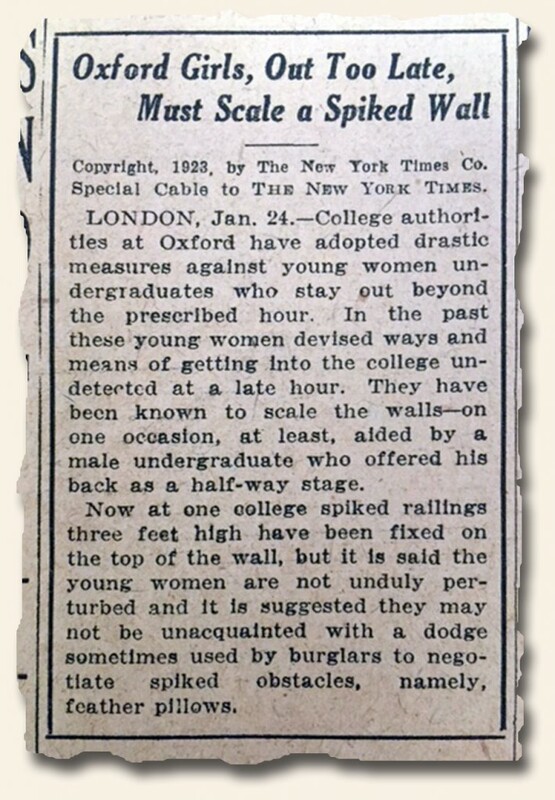 While the burning of brassieres marking the throwing off of gender roles and stereotypes did not become popular until the 1960’s, the front page of the New York Times for January 25, 1923 had an interesting article regarding the young woman of Oxford which foretold of things to come. Perhaps the idiom “You just can’t keep a good (wo)man down” is appropriate in this instance. Enjoy.